After the birth of his first child, Ben and with his 31st birthday looming Chris Holmes took the brave step of quitting his 9 to 5 job at Stansted airport. In impeccably piped lettering he wrote: ‘Today is my 31st birthday, and having recently become a father I now realise how precious life is and how important it is to spend my time doing something that makes me, and other people, happy. 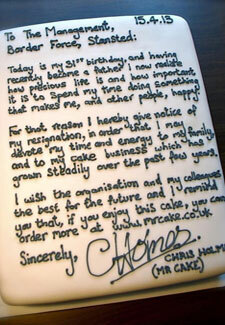 ‘For that reason I hereby give notice of my resignation, in order that I may devote my time and energy to my family, and to my cake business which has grown steadily over the past few years. The pastry expert from Sawston, Cambridgeshire, signs off his resignation cake with a plug for his budding business, which he began when he made his own wedding cake in 2010. We applaud you, Mr Cake. But just one question, is it classic sponge or chocolate hidden under that icing?